If you haven’t had to budget for your food shopping before then you probably have little idea of the realities of prices. When you do a big shop it’s very easy to get caught up in the excitement of an empty trolley and lots of lovely shelves stacked full of goodies. However it can all add up rather quickly and if you’re not careful you could be well over your budget before you reach the checkout. There is an upside however. Not everything is as expensive as you might think. While you will probably steer clear of certain isles or items, believing them to be well out of your price range, you might actually be pleasantly surprised to learn that you can afford to drop them into your trolley. Just because you’re a student doesn’t mean you have to stick to cheap supermarket ranges and buy pasta and beans in bulk. Sure, you’ll need to be careful and work out your budget but there are plenty of great ingredients out there that won’t break the bank. Here’s the low-down on five great ideas that will each give you plenty of change from a fiver. There’s no reason to bypass the fresh fish counter just because you’re at college. Whilst prawns certainly sound like a luxury foodstuff, the price doesn’t always reflect this. Better still, try sourcing a local fishmonger or buy directly from the fishermen if you live near the coast. See how many juicy tiger prawns your fiver will get you and then cook up a curry or a stir-fry. Alternatively, serve as a decadent starter with a little garlic mayonnaise for dipping. This traditional spiced Spanish sausage is a great store-cupboard item. It has so many uses and can help to transform any number of otherwise bland dishes into something quite spectacular. You’ll definitely get your money’s worth by splashing out on a really good-quality chorizo. Try slicing or chopping it and adding to omelettes, pasta sauces, pizzas or risotto for a deep, rich flavour. Also known as cep, these are another great ingredient to keep tucked away in your store-cupboard. A small tub of dried porcini might seem like an extravagance but a little goes a long way and the flavour is incredible. You can scatter just a few of these into a simple tomato and onion pasta sauce and it will be lifted to something really special. Packed with those essential omega 3 fatty acids, this should be your fish of choice. You will often see salmon on special offer in supermarkets so take advantage of this and make your fiver go further. It’s easy to cook and has a delicious flavour. We should all be eating two portions of oily fish per week so it’s definitely worth giving salmon a go. Try grilling, baking or pan-frying salmon fillets. You can also flake up cooked salmon and mix it with some crème fraiche and sun-dried tomatoes for a creamy pasta sauce. 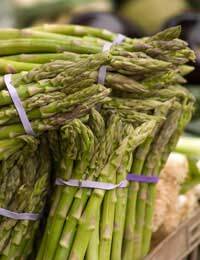 British asparagus is renowned as being amongst the best in the world and why should you miss out? It has a very short season (around May-June), however, so you need to be quick to make the most of it. It’s easy to cook and can be eaten on its own as a starter, or used in quiches, flans, pasta sauces, or as an accompaniment to fish or meat. Try these ingredients out and you’ll discover that you can afford to diversify your diet without breaking the bank.